Chelseaâ€™s assistant coach, Gianfranco Zola has identified Derby County stars: Mason Mount, Richard Keogh and Fikayo Tomori, as players that performed excellently following his sideâ€™s 3-2 win over the Champions side on Wednesday night in the Carabao Cup encounter. 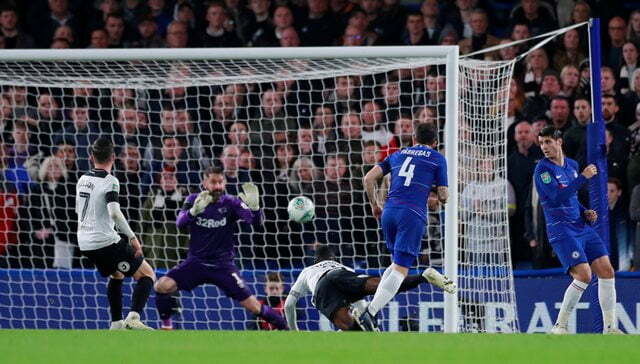 Cesc Fabregasâ€™ first half goal ensured Maurizio Sarriâ€™s men defeated Frank Lampardâ€™s Derby at Stamford Bridge. Zola, however, said Tomori, Keogh and Mount performances against the hosts were excellent. Dailymail quoted Zola as saying at post-match said: â€œHe [Tomori] was unlucky with the own goal, but the performance he and [Richard] Keogh put on afterwards was excellent. â€œIt happens. If he hadnâ€™t touched the ball, [Alvaro] Morata would have scored a goal. He played well.